SCHEDEL - [Text page with Martyrs. Terta Etas Mundi. Foliu. CLVII ]. SCHEDEL, Hartmann. - [Text page with Martyrs. Terta Etas Mundi. Foliu. CLVII ]. [Text page with Martyrs. Terta Etas Mundi. Foliu. CLVII ]. - SCHEDEL, Hartmann. Title : [Text page with Martyrs. Terta Etas Mundi. Foliu. CLVII ].. Size : 14.6 x 9.1 inches. / 37.0 x 23.0 cm. 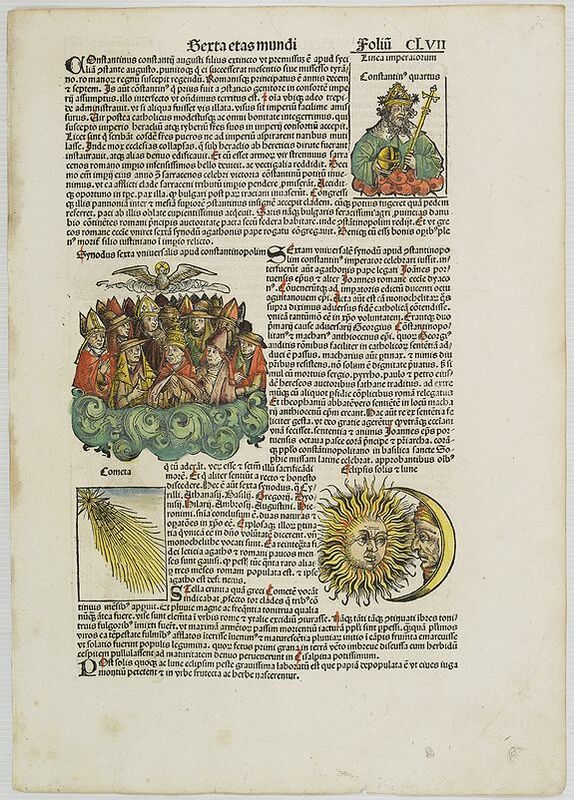 Description :Latin text page with woodcuts of the cosmic elements of the sun and moon, Kings and Popes. The verso side is printed with text and is illustrated with images of Popes. Condition : Some marginal browning and staining. Overall toning. Dark impression on large sheet. Else very good condition.